With OC Best Rentals, whether you are looking for a relaxing vacation or a vacation packed full of activities, you will find it in Ocean City, Maryland. 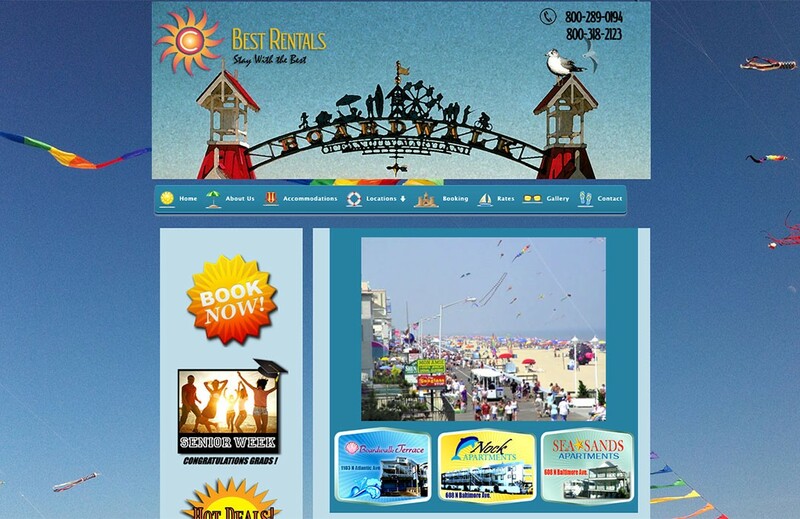 Choose us for your Ocean City beach vacation and enjoy comfortable accommodation at an affordable price. The proprietors of 3 seasonal apartment houses came to us out of frustration with their previous hosting and management provider. They were not getting updates as promised and their website was a style “from the 90’s”. NBR Design was able to quickly provide the m 4 websites with photography logo and graphic design at a reasonable cost and has continued to keep them updated and fresh over the past 3 years. It was a delicate dance because even though the sites all look similar there are dozens of unique photographs, graphics and other design elements t each one all handcrafted by our awesome design team.